Jerusalem Kosher News » Eating Out in Israel on Sukkos? Is the Sukka Under Supervision? Eating Out in Israel on Sukkos? Is the Sukka Under Supervision? I was wondering [again] if hashgachos on hotels/restaurants take responsibility for the sukk during Sukkos. As such, I decided to once again attempt to contact some of them and ask. Following are the responses I received in the order I received them. (I was very careful in translating since some responses may be viewed as ambiguous by the reader. For additional clarification, please contact the hechsher in question, not JKN). In response to your question, the Chief Rabbinate of Jerusalem does indeed have the responsibility for the kashrus in eateries under its supervision. Any sukka in proximity to the store is under our supervision. As in years past we will take responsibility only for Sukkos (in our establishments) that have a teudah from the office certifying their sukka as Kosher. I asked for a clarification and was told that in addition to the regular teudat kashrus, one should see an additional certificate attesting to the kashrus of the sukka. In response to your inquiry – generally speaking, regarding a hotel/restaurant under the supervision of the badatz, the mashgiach supervises the kashrus of the sukka. Posted on September 16, 2013 by JKN Israel. This entry was posted in General Interest. Bookmark the permalink. Thank you for briging this to our attention. We can’t expect a kashrus organization to also be in charge of a sukka at an establishment. It is up to the consumer to decide which sukka he will eat at. Anyone who is interested in eating in a restaurant’s sukka can find out for himself if it’s kosher enough for him. You can’t throw everything in the direction of a mashgiach kashrus. We have to take responsibility for own kiyum hamitzvos. SK, I disagree. It’s quick and easy to check a sukkah, the sukkah’s status is unlikely to change over the chag, it is (or should be) a major consideration for many who eat there, and most people are not expert in the laws of sukkah. So why not check? It isn’t so easy to check a suka at all. Do you know how it was put up? Were the walls built before the schach? I was riding the light rail this morning and noticed at least two sukkot in the downtown area that were merely metal frames with the schach already in place. 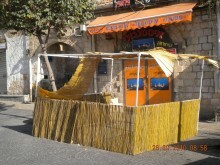 Once the cloth walls are attached, no one will be able to tell from a visual inspection that those sukkot are pasul. and re-lowering the schach לשם סוכה when you want to use the sukka? BOTTOM LINE: we are all ignorant when it comes to Succot & the Hashgachat Kashrut of an establishment & their Sukkah. NOW, we have TWO THINGS TO WORRY ABOUT!! 1. Whether the Kashrut Hechsher Te’udah is current, the “real deal” and if it meets our standards. also have an additional Te’udat Kashrut for the Sukkah of said establishment! No need to check all the details of the Kashrut of the Sukkah, nor to start guessing how and in what order the Sukkah was put together! FOR THE REST, it sounds like eeny-meeny-miney-moe… and if you want to rely on a game of chance, that’s your prerogative… BUT, after reading SHLOMO’s comment regarding his observation of two establishment’s Sukkot being assembled — everything up, except the “walls” – WHO KNEW that owners don’t know/don’t care, do what’s convenient when time is a shortage and there IS NO MASHGI’ACH supervising! THIS IS A VERY SCARY THOUGHT! EATING OUT ON SUKKOT IS STARTING TO RESEMBLE EATING OUT ON PESACH, in a difference sense, but just as serious! AND FOR ALL THE JEWS FROM CHU”L coming for the CHAG,… YEAH, they think E”Y, JERUSALEM… kosher, kosher, you can eat anywhere, no need to worry… they have a kippah, oh that’s fine! great! and there are other kippah wearing men eating at that establishment! NO PROBLEM! BOY, JKN SHOULD BE REQUIRED READING FOR THE KOSHER CONSUMER – FOR THOSE ABROAD PRIOR TO GETTING ON THE PLANE & FOR EVERY ENGLISH SPEAKING KOSHER OBSERVANT INDIVIDUAL HERE! WHO KNEW THAT THERE IS SO MUCH FRAUD, CORRUPTION, DISINFORMATION, LACK OF INFORMATION, ETC., WHEN IT COMES TO KASHRUT – EATING OUT, CATERING EVENTS & PURCHASING ITEMS FROM STORES WHO SELL UNPACKAGED LOSE ITEMS BY WEIGHT (i.e., flour, cocoa, etc.)…. AND, LET US NOT FORGET ABOUT WHAT GOES ON IN MACHANEH YEHUDAH SHUK: who is guarding “the fort” when meat/poultry is delivered in the “am” hours?? and what about making sure that trumot, ma’asrot and orlah have been taken from the produce you are purchasing? – for this, we already know that you MUST LOOK FOR THE TE’UDAH!! HOW CAN ALL THIS CHANGE FOR THE BETTER? 3. Rally the Kosher Consumer to demand that they stop playing politics, pay their mashgichim decent salaries so they don’t take on 10 establishments in order to make a very lucrative monthly salary – but rarely show up at those establishments, as he’s supposed to! And, demand better, yir’ei shamayim mashgichim, who are detailed and diligent… who have a shem tov – trustworthy! OK, so… when is this all gonna happen?